Media & Interview Contact: Kyle James, [email protected], (530) 524-4718. Welcome to Rather-Be-Shopping.com! My name is Kyle and I am a father to 3 kids (17, 14, and 11 years old), and with my wife's help, we keep this website updated daily with the best online coupon codes, printable coupons, and bargains that we can find to all your favorite online stores. The idea behind this website is to save you a few bucks with coupons while shopping online. Very few websites have the large number of stores and coupons that you will encounter here at Rather-Be-Shopping.com. We try really hard to have only coupons that have not expired, but we still encourage you to always verify that your coupon is visible in your order total prior to you finalizing your purchase. 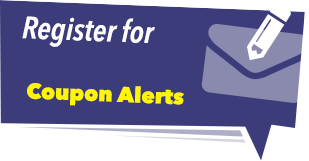 Please Register Now and create your 'Coupon Alerts' to all your favorite stores. That way you will never miss a coupon again. There is nothing worse than paying full price when you don't have to. This site was started in December 2000, and after a HUGE learning curve, we have the coupon website that you see today. Rather-Be-Shopping.com has been mentioned on MSNBC, Today Show.com, Woman's World, Reader's Digest, and L.A. Daily News to name a few publications. I'd love to hear from you with any feedback as to how we can better serve you. Also, let me know your money saving success stories involving the use of any coupons you may have stumbled across on my website. I really love to hear from my visitors and your emails often make my day. Please feel free to e-mail us with this Contact Form. I look forward to hearing from you soon. Are you new to the online shopping scene and not sure how online coupons work? Then just click on this link, 'How Coupons Work'. If that page does not answer all your questions then e-mail us with this Contact Form with your specific question or check out our video tutorial on the '3 Types of Online Coupons'. Happy Shopping and Happy Saving! What is Rather-Be-Shopping.com? - Rather-Be-Shopping.com is an online coupon and deal finding site where our mission is to find, sort, and post the best online coupons and free shipping codes available to help you save money when shopping on the Internet. We currently have over 5,000 coupons in our database, good at 800+ online stores. Who is this "Kyle" Character? - Well, that's me. My name is Kyle James and I am the brains and brawn behind Rather-Be-Shopping.com. To learn more about me be sure to check out My Blog where I write about creative ways to save money as well as the adventures of working from home and raising three kids! Do I Have to Pay to Use Rather-Be-Shopping.com? - No. Our site is completely free to use. How Do I Find the Coupon I am Looking For? - There are several ways. You can use our Search Box at the top of this page, or you can find coupons by category, or by letter. All of these options are at the top of this page. Why Would I Want to Register? - If you register, you will get coupons sent directly to your inbox via email in the form of 'Coupon Alerts' (Video Tutorial). You pick your favorite stores or categories and we do the grunt work. Just Register Now and you will start getting only the coupons you want, when you want them. How Long Has Rather-Be-Shopping.com Been Around? - Since 2000. With over 14 years experience, we have become a trusted industry leader who knows how to find all the best deals and coupon codes so you can save the most money when shopping online. How About Free Shipping Coupon Codes, Got Any? - Absolutely. We have a Free Shipping Coupons page that pulls all free shipping offers out of your database for you. Updated daily. Leave the car in the driveway and shop from home. Not only will you save on gas, but you will typically find a better deal shopping online. Finally, please feel free to E-Mail Us if you have any other questions about using online coupons. Thank you for stopping by, please click around the site and check out what we have to offer. A bunch of cool goodies for members of the media.